Royalmont Academy students get the best of both worlds. A state of the art building, nestled in one of Mason, Ohio's quiet neighborhoods. Our 110,000 sq. ft. building rests on 14 acres and is home to 59 classrooms, chapel, two libraries, two gymnasiums, auditorium, computer labs, chemistry lab, science lab, cafeteria, multiple playgrounds, and an interior courtyard. The campus is perfectly situated to allow families to have all of their children in one location. With preschool through high school offered at Royalmont Academy, it's a unique design that complements your child's learning capabilities. 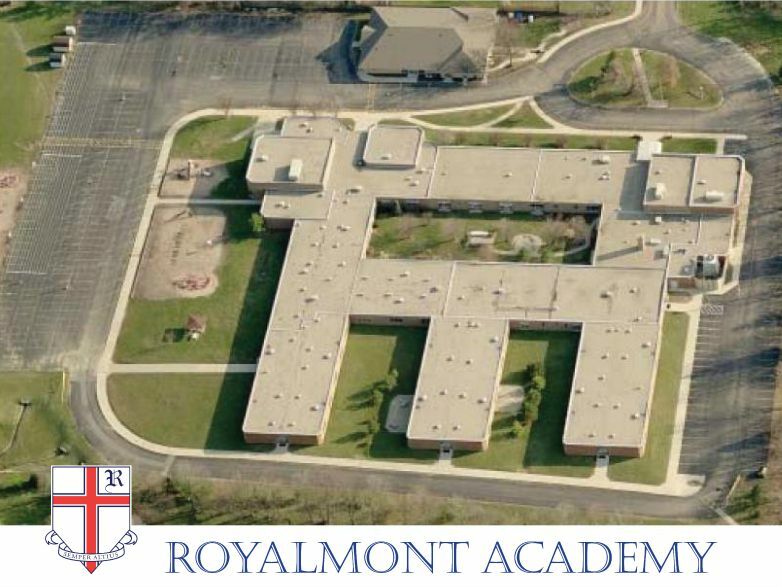 In fact, Royalmont Academy is Warren County's only Catholic school offering preschool through high school! We invite you to call and schedule a tour of our campus so you can see for yourself all we have to offer. 1. The number of students enrolled in the school by the last day of October of the current school year. 2. The school's policy regarding background checks for teaching and nonteaching employees and for volunteers who have direct contact with students. Our school complies with the Decree on Child Protection as promulgated by the Archbishop of Cincinnati. Our fingerprinting policy includes manual fingerprinting for employees and electronic background checks for all employees and volunteers.